THE IRISH HILLS-A jewel of blue sky, fresh air, and sparkling lakes. Stay at a member inn near the beautiful Irish Hills of Southern Michigan, and visit Hidden Lake Gardens, MSU’s 755 acre Botanical Gardens which is absolutely spectacular in the spring! Stay 2 nights in April and receive free admission to the Gardens and a $10 gift certificate to their gift shop. (Must mention this special when reserving and not valid with other specials) call 1-800-815-5253 for reservations. “It is so relaxing to sit on our front porch with a cup of coffee on a Spring morning and watch the natural beauty of spring in the country and listen to the “frog choir” tuning up! All of this is available at Quigley’s Log Home B & B in Hudson, MI. Voyager’s Inn in Three Rivers MI is celebrating its 5th anniversary. Stay two nights in the St. Joseph Room or the Portage Room, and the 2nd night is 25% off. Need an extra day of relaxation? A 3rd night is just $69.00! April 1-25, 2012. Spring has sprung at Albion’s Palmer House Inn. Book one night at regular price and get 50% off the 2nd night. A romantic spring getaway package is available every night of the week at Munro House B&B in Jonesville MI. 2 Dinners, 2 massages, and 2 nights bed and breakfast are on the agenda. 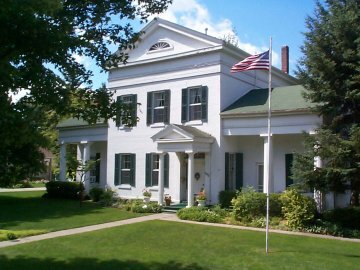 Arrive in downtown Joneville, park your car, and walk to dinner, get spa services done on-site, and enjoy the oldest house in Hillsdale County. There is no need to worry about gas money, because everything is within 2 blocks. With gas at +$4.00 per gallon in much of Michigan, a local getaway that burns less than a tank of gas is a more economical idea than several tanks of gas to go to Florida and back. A Spring getaway to Southern Michigan may be a better choice than heading South. This entry was posted in Spring and tagged Botanical Gardens, Dewey Lake Manor, Munro House Bed and Breakfast, Palmer House, Quigley's Log Home Bed and Breakfast, Southern Michigan Inns, Spring Getaway Ideas, Voyagers Inn by admin. Bookmark the permalink.